RONALDO is class and I have said so many many times, so has everyone else with any emotional investment in Manchester United. United fans offer no apologies for the support we offered that player when he was blamed for everything and the kitchen sink at the World Cup, we are reaping the benefits of the boy being at the right club for him at that stage of his career and now at this, the squeaky time of the season. Newspapers make me laugh, every single part of the media makes me laugh. During this season at various points we have had “he’s off, he can’t play in England again”, “He won’t play with Rooney” – tabloid exclusives apparently, who were then sent wheeling backwards when he didn’t in fact leave England, leave Manchester United, hate Wayne Rooney or even have a problem with the manager. The only problem was that Sir Alex hadn’t updated his phone book with Ronnie’s new number, easily done, Sir Alex, easily done. Then the Gods of the Spanish Press over at Marca thumb their nose at Ronaldo’s happiness at United and the club’s stance that he is not for sale, by reminding us of all the times Real Madrid have been told a player was not for sale. Yet again, if the lad himself said anything it was big news, if he said I am happy at United, they added ‘at the moment’, if he said nothing on the subject it was taken as a sure sign he is leaving. Manchester United and Ronaldo himself cannot win in this situation. The club and the player are making all the right moves, discussing a new contract, and the boy is making statements with his feet. The statement being, United = Premiership. Full stop. 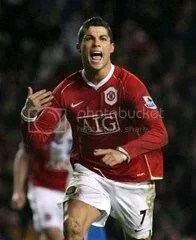 If there are more competitions that come up between then and now, you get the feeling that our boy Ronaldo would happily represent Manchester United on his own. In this form, he would probably beat the opposition too.